BERLIN (Bloomberg) -- BMW AG returned to a profit in the first quarter as the top-of-the-line 7-series sedan attracted buyers. Net income was 324 million euros ($421 million), or 49 cents a share, compared with a loss of 152 million euros, or 23 cents, a year earlier, the Munich-based maker of BMW, Mini and Rolls-Royce vehicles said today. Profit beat the 264 million-euro average estimate of eight analysts compiled by Bloomberg. Sales rose 8.1 percent to 12.4 billion euros. BMW is counting on a new version of the 5 series, which was introduced in March and shares parts with the 7 series, to help defend its position as the world's biggest maker of luxury vehicles. Volkswagen AG's Audi has set a goal of dethroning BMW as the world"s No. 1 luxury-car manufacturer by 2015, while Daimler AG's Mercedes-Benz, which BMW overtook in 2005, plans to take market share in 2010 by growing twice as fast as the industry average. Earnings before interest and taxes will rise in 2010, fueled by a “solid single-digit” percentage increase in deliveries, BMW said today, reiterating an earlier forecast. The automaker has a target of selling at least 1.3 million cars and sport-utility vehicles this year compared with 1.29 million in 2009, its lowest full-year sales since 2004. Reithofer said on March 17 that BMW aims to make progress this year on a goal of raising Ebit from automaking to 8 percent to 10 percent of sales by 2012. BMW's car-manufacturing unit posted a loss of 588 million euros in 2009 after revenue fell 10 percent to 43.7 billion euros. First-quarter deliveries rose 14 percent to 315,614 vehicles, boosted by a 54 percent surge in sales of the 7 series. The car shares as much as 70 percent of its parts with the revamped version of the cheaper 5 series. Demand for BMW's vehicles more than doubled to 34,179 in China and to 1,658 in Brazil, the company said on April 12. In addition to the 5 series, the manufacturer will expand its lineup this year with the Mini brand's first four-door model, the Countryman, which will go on sale in September. BMW aims to begin selling electric-powered city cars by 2013, while front-wheel-drive compacts under the BMW brand may roll out in 2014. The models, as well as additional production capacity in the U.S. and China, underpin the automaker's goal of selling more than 2 million cars and SUVs by 2020. 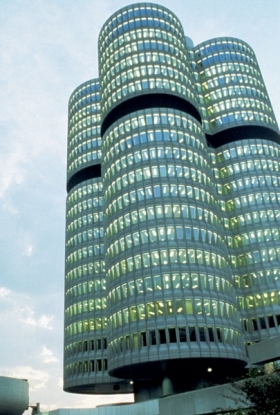 BMW fell 1.54 euros, or 4.1 percent, to 35.84 euros in Frankfurt trading yesterday. The stock has gained 13 percent this year, valuing the company at 23 billion euros.